Tasty Tuesday, MEGabite #31/71 counting down. Gourmet Pizzza at Cosmo’s. 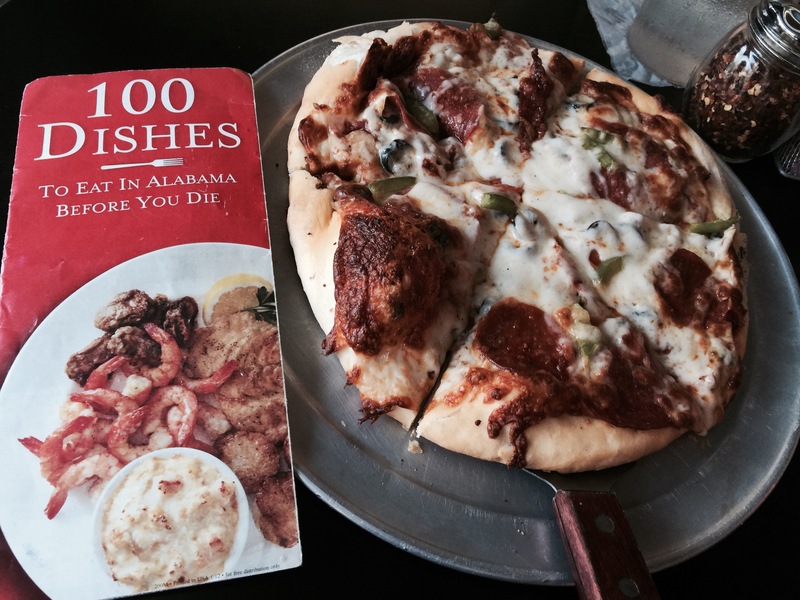 100 Dishes To Eat In Alabama Before You Die. Cosmo’s is located in the 5 Points area of beautiful Birmingham, Alabama. Surrounded by interesting building’s,a gorgeous fountain by a renowned artist and fantastic restaurants. Cosmo’s has a kick back, whimsical, colorful feel to the place; the kind of style that one often finds near Universities. You know the type; hipsters, artists and freethinkers. It is not surprising that the menu hold interesting and creative choices. I visited on a Sunday afternoon. 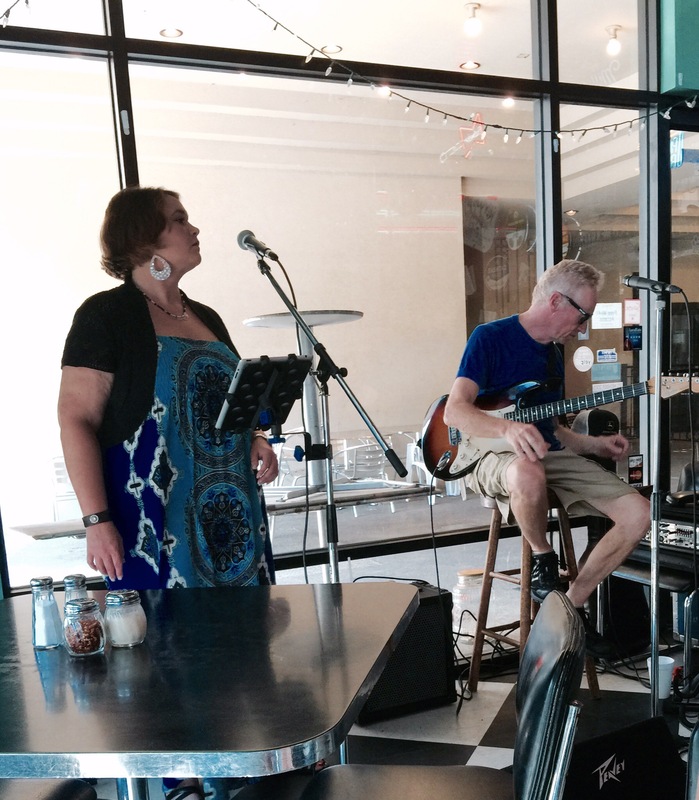 It was super fun to find live music and gaze upon the great looking brunch dishes that were placed on nearby tables. There were pitchers of mimosas and bloody Mary’s flowing and a bloody Mary fixings bar. I almost had a difficult time having pizza since the gourmet brunch and sandwich dishes looked really appetizing and creative. Brunch is served from 10-3 and there seemed to be a mix of customers having brunch, pizza and other dishes. The pizza menu is a pizza lover’s dream. I am a pizza lover. It may be my favorite food. I loved that there are options for all pizza lover’s tastes; red sauce, yellow sauce, pesto sauce, crusts that are hand tossed white or wheat. You may order small, medium, large and pizza by the slice. 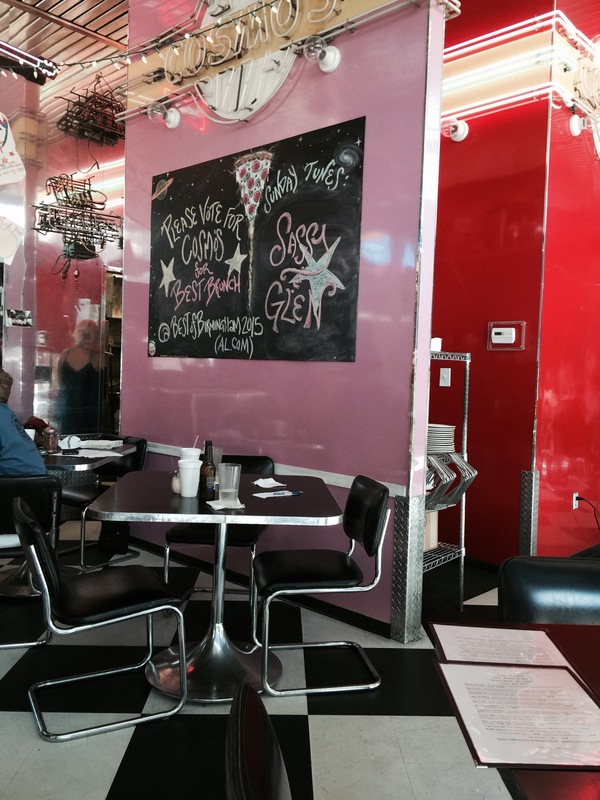 However, Cosmo’s is known for their creative pizza toppings and the toppings menu. With many fresh and interesting items that are not standard at chains and even gourmet pizza restaurants. With items such as; Cajun chicken, alligator, eggplant, zucchini, Tasso ham, smoked gouda, pine nuts, fresh garlic, fresh tomatoes, artichoke hearts, to name a few. 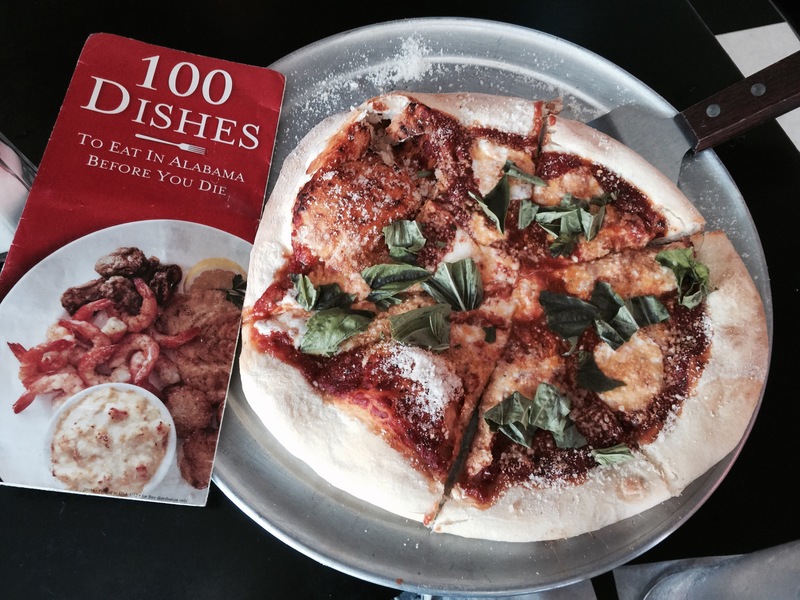 The “100 Dishes” is a Signature Pizza. I ordered two-signature pizzas from the menu so that I might try a few different styles. One of the pizzas was called Rock and Roll and was cooked with red sauce, cheese, black olives, mushrooms and sausage. Cheesy goodness, yum! The second pizza was also off of the signature menu and was called The Soprano. Cracker thin crust with red sauce, fresh mozzarella, basil, and a sprinkle of Parmesan. I really loved this crust. It was crispy with a buttery taste. YUM! As you can see, the toppings and especially the fresh mozzarella were a bit sparse. I enjoyed the music, the menu and liked the pizzas. However, I had one of the most unusual and worst customer service experiences that I can ever remember having. I prefer to frame my own unique opinion and never read reviews of restaurants before I visit and work on a write up. Because I was so shocked by my long wait and service experience, I read reviews after my visit and noted that other folks had the exact same experiences that our visit held. Out of peace and courtesy towards another human being, I do not want to get into great details; clearly there are issues present. What I will say is that we had to guide each step of our visit; seating, ordering, drink requests, check etc. and that we waited 70 minutes for our pizza. Like, dude, where is my pizza? If you are interested in the other issues, you may read Yelp or Google reviews. MEGastars: Because the meaning of cosmo’s is the sum total of everything, I give them 3 MEGastars. ** for great tasty pizza. * for handcrafted crusts and local ingredients. Please do read the reviews before you go and/or go with patience and peace. They have a fantastic brunch menu. I was nearly bewitched by those choices. Playing “The 100” Go on a weekday so that you are not tempted. Loved that brunch menu and cool music. Post Office Pies has some awesome pizza. Located in a historic building, they have brick ovens, are speedy, courteous and professional. I felt the pulse of Birmingham there.